The Awful Grace of God – Theatre Review | That's So Rad! Seasoned actor Michael Harney, widely known as Inmate Counselor Sam Healy in the Netflix original Orange Is the New Black, brings to the stage an evening of six one-act plays in The Awful Grace of God. Harney reunites with Director Mark Kemble after starring in Kemble’s touching drama, Bad Hurt, to gather a production team and a group of exceptional actors for his new play. Each play is set as short open-ended stories in a different location and time, giving the audience a chance to come to their own personal conclusion based on how the story resonated within themselves. The production team put together an incredible yet simplistic set using six backdrops facing specific directions and beautifully projected imagery and sounds. 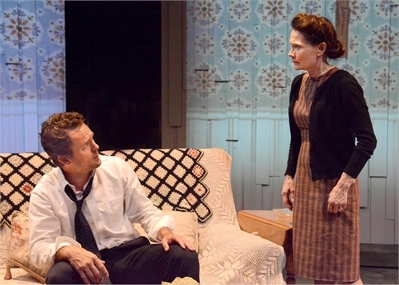 From 1970s Queens to a New England snowy porch in the woods to a seedy motel one might find down the street, the stage is transformed into each of the locations in the play. A few pieces of furniture and a single pole with a man chained to it transport the audience to that moment in time as the actors bring each act to life. 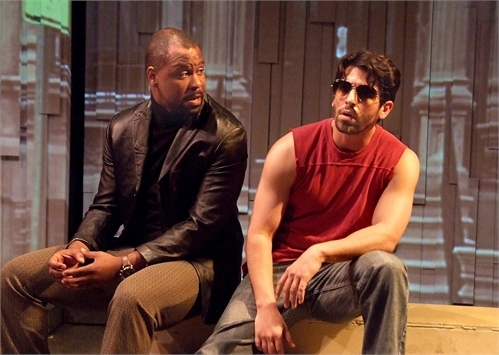 Off stars Curtis Belz and Bechir Sylvain as Joe and Stan having a conversation on the steps of their homes in early 70s Queens, which leads to an exploration into how they cope with their histories of violence. Surrender is set in a present day New England cottage where Tim DeZarn as Dodge and Janine Venable as Ellen search for a way to communicate their love and find meaning in life after losing their child. 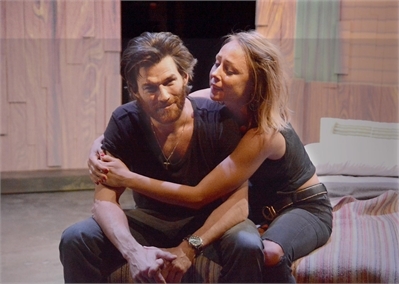 Willy and Rose stars Johnny Whitworth and Agatha Nowicki in a seedy modern day motel. Rose loves Willy regardless of how much they may struggle with money but Willy just wants to give her the best life he possibly can. Yet their passion isn’t always in their favor. In The Long Walk Home a family struggles to stay together when the violence of addiction continues to tear them apart. Starring James Harvey Ward as Joe, Amelia Jackson-Gray as Kate, Tim DeZarn as John and Janine Venable as Ann, this story is set in 1950s New York City. Need (Shelter From The Storm) stars Marie Broderick as Katherine and Marshall McCabe as Francis (with some dates starring Ilia Volok as Francis) and takes place in a present day Psychotherapist’s office. It explores how the power of love can break through any obstacle in its path. Finally, Through, starring Oscar Best as Zip, portrays one man’s personal struggle to find freedom and escape from the ties that bind him. Additional cast members provide background voices and additional roles to bring each story together. While every act was written to be open-ended, each play ended in a place where the audience could let go of that moment and grab onto the very next. Every cast member put on an excellent performance with the accents and emotions they portrayed. Michael Harney’sThe Awful Grace of God is an enlightening piece of work about how suffering and love have the power to change and inspire everyone. Sam Healy may not be the most capable of counselors for the inmates at Litchfield Penitentiary, but Michael Harney has both the acting and writing power to make an audience feel compassion in the most vulnerable of situations. Experience the awful yet powerful grace of God through this valuable work of art that Michael Harney, Mark Kemble and the cast and crew have brought to the The Other Space. The Awful Grace of God runs through May 28 at The Other Space @ The Actors Company. Tickets here.